Credit for the impetus of this article must be given to my friend, aerodynamicist Clive Leyman, who initiated a discussion on these issues. He provided the technical foundations, including correcting and clarifying portions of this article. Portions of this article are based on a paper written by Clive Leyman, which have been revised as necessary for a more general pilot audience. There has been much written in the aftermath of the Air France 447 accident regarding aircraft stalls, pilot training and similar aspects. In a previous article I outlined some of the cognitive aspects that were likely involved with the accident. 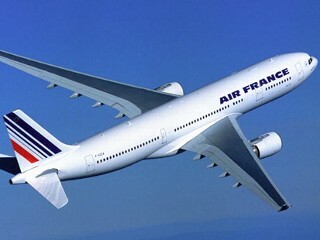 Many pilots have wondered why the Air France crew did not recognize the stall itself. In this article I will explore some of the aerodynamic effects involved in high altitude stalls which can make the problem much more complex than many pilots might realize. Modern airliner wings have been designed to minimize drag at the design cruising Mach number. The aerodynamic design of the wing is based on the necessity to reduce wave drag and lift induced drag, and may be modified to reduce wing bending moments and weight. These compromises mean that the way the air starts to separate as the angle of attack approaches the stall, and what forces are generated as it does so, may be significantly different than what most pilots are expecting. As outlined in the figure below, on a typical airliner wing, the air will start to separate about 2/3rds of the way from the root to the tip. It starts on the aft portion, so the forward section of the wing is still developing normal lift. This results in a gentle pitch up. 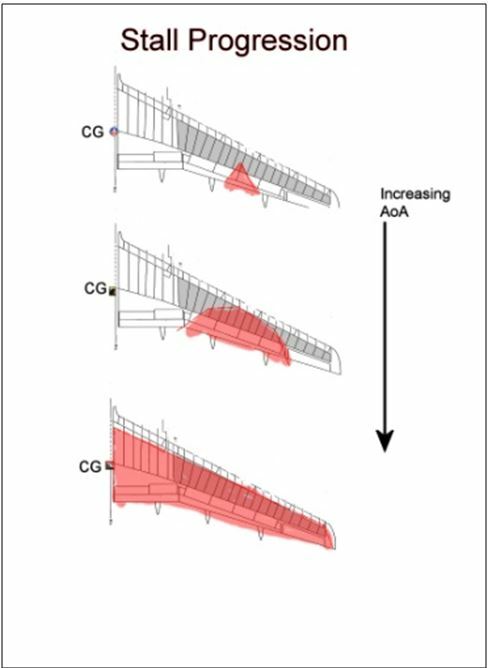 As the angle of attack is increased, the separation will move forward and across the wingspan, but these separations are still aft of the CG, so the aircraft will continue to have a gentle pitch up. It is only after the inboard part of the wing stalls that there will be any pitch down at all, but in reality, this will likely just appear as a cessation of the pitch up. Modern wings are designed to be “supercritical”, meaning that they are designed such that during normal cruise over a large part of the wing upper surface the airflow is supersonic, decelerating through a shock wave lying about two thirds to three quarters wing chord. It is across this shock wave that the initial airflow separation will most likely begin, and that is near the trailing edge of the wing. This will be perceptible as buffet. Additionally, some of the lift is produced by positive pressure on the lower surface near the trailing edge. This has the effect of increasing the lift on the wing with increased angle of attack for quite some time after the air flow on the upper surface as begun to deteriorate. The experience most pilots had in primary training is a bit different. In most trainer aircraft during the stall the airflow separation results in a loss of lift early in the process. As the airflow continues to deteriorate there comes a point where there is a fairly significant pitch downwards known as the “stall break” which is coupled with a simultaneous significant loss of lift. The buffet is significant, and very obvious. By contrast, the modern airliner wing will still see the lift increasing somewhat after the point that the pre-stall buffet has occurred. This may, or may not coincide the the AoA at which the stall warning is triggered, with choice of that point left to the designer. Beyond that pre-stall buffet the lift goes on increasing very slowly (from the bottom surface flow), but the buffeting gets steadily worse. At some point there is a change in the character of the buffet (magnitude and frequency) accompanied by a loss of lift. Taken together these may define “stall”, but it is difficult to identify the exact point without recourse to instrumentation. This is quite unlike anything met in training. - VMO/MMO corresponds to an important limit in the performance and limitation curves, for airline pilots; although the “classic” stall is perceived as being fairly well known, and is experienced by pilots (at least during their initial training), excursions well above the VMO/MMO are not demonstrated in training. It would take a very large excursion above Mmo before adverse effects, and most such effects would be issues with flutter or hinge moments with large control inputs. Any buffet experienced is almost certainly going to be due to pre-stall or stall buffet. Also, high speed buffet will feel different (see discussion below), likely higher frequency and less likely to incite the aircraft’s natural frequency. In the case of dynamic stalls only, a significant roll into or out of the turn which is not immediately controllable. As previously described on many modern wing designs the airflow separation will slowly spread outwards and forwards from the initial point. This means that any changes in pitch or roll from the approaching stall can take place over a relatively long period of time (depending on the rate the AoA is increased), and there are no sudden indications. This can somewhat mask the approaching stall, which can then only be identified through the severe buffeting criteria. Further complicating this is that the initial buffeting could be mistaken for turbulence, as appeared to be the case in the other events described in my article on cognitive bias. It is possible that mountain wave action or turbulence can induce a stall warning and possibly even pre-stall buffet at high altitude, although it is unlikely to cause an actual stall. To further elaborate on what the buffeting might be like for the pilots in a large transport, consider the following charts derived for the Air France 447 accident, notice the amount of buffet in both vertical and lateral, with almost plus or minus 2 g’s vertically and half a g laterally, and at a fast cycle of around 2-3 times per second! The airplane fuselage’s natural frequency will have a great influence here. Boeing test pilots have described it as akin to driving sideways across railroad tracks – and I don’t mean tracks embedded in pavement, think driving sideways across a railway yard at 20 mph with no shock absorbers! If you were experiencing that what would YOU think was happening (absent prior knowledge of it)? What does an airplane feel like as an engine is falling off or some other sort of structural damage? Put yourself in the situation with zero prior knowledge (which you now have). One more point. If you do find yourself in buffet, high or low speed, and you really do not know which it is, it is probably best to “push” either way. That is obvious if it is low speed, but why high speed? Because you will descend away from the buffet boundary. AF 447 was in cruise flight at FL 350. The Captain had chosen to take the “middle” nap, which is typical. Unless unusually tired, most Captains will take a turn in the middle of the flight so they can be present for the more complex procedures during the first and last portions of the flight. This can be altered, of course, depending on when they are tired, the Captain might choose the first or last period also. The area of weather was still about 80 miles ahead of them when the Captain went back to take his nap. Thunderstorms are typically somewhat numerous crossing the tropics, and it is probable that the aircraft radar was not depicting anything of significance that far out. Furthermore, as I have outlined in other articles, thunderstorms in the ITCZ region do not depict in the same way as storms at higher latitudes, particularly at night over the water. The reflective portion tends to be much lower. While some have questioned the decision of the Captain to take his rest at that time, it is not so surprising given the information present. There was maybe weather ahead, but it likely did not look particularly significant on the radar. Again, there is a good chance it was not depicting much at all, as I have described in previous articles (here and here). Further, it was likely that there would be more storms over the next several hours as they continued across the tropics. Waiting was unlikely to improve things. Personally, I would have chosen the first or third rest period just because I do not sleep well in turbulence and I have a bit more training with radar usage than many, but it is hard to second guess this Captain’s decision. This left the First Officer in the right seat, as the flying pilot, and the relief First Officer in the left seat, as pilot monitoring. 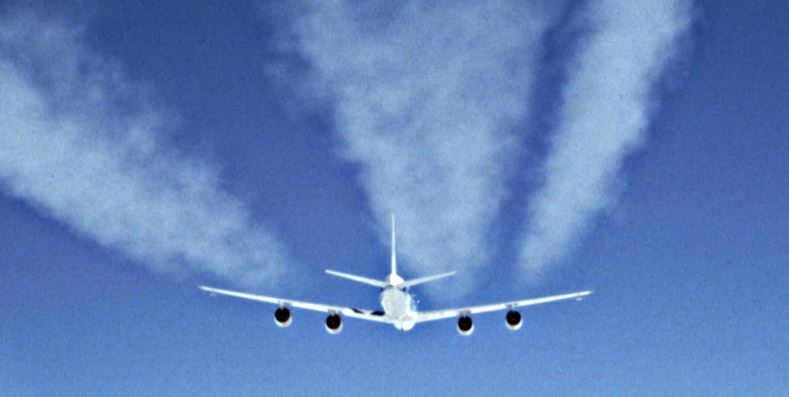 When the aircraft encountered an area of high altitude ice crystals resulting in the loss of airspeed indications the autopilot and autothrust disconnected, unable to function without airspeed. With the loss of airspeed came a multitude of various warnings as each system that utilized airspeed in some way indicated a problem. Furthermore, as the system incorporates what is known as integrated modular avionics, these failures propagate across the other computers in very unpredictable ways, a cascading series of faults, with each box now receiving bad information sending its failure messages out. The flight controls reverted to a degraded state where the pitch mode was still working normally in terms of response, but no longer had any of the stall protection features. Meanwhile, the roll mode went to “direct law”. In “normal” operation the pilot would have become accustomed to the Airbus FBW mode where stick movement commands roll rate and centralizing the stick gives zero roll rate (holds the bank angle). However in direct law stick movement commands roll acceleration and centralizing the stick leaves the pilot with a residual roll rate. To cancel that one must apply opposite stick motion. The A330 is also a surprisingly nimble airplane, and it is easy to over-control the roll when in direct law at altitude. It is a bit like going from flying a big jet to a Learjet, instantly. Few pilots would not “overcontrol” at least initially. The pilot found himself flying an aircraft at altitude by hand. Due to the lower dynamic pressure and higher true airspeeds for the same equivalent airspeed (EAS), there is less damping at that altitude, so not only is the aircraft flight control system in a degraded state that is not normally seen outside of a demonstration in the simulator during initial training, but it was in a flight regime most pilots today have never “hand-flown” an aircraft at due to RVSM rules. With such a sudden change in aircraft dynamics coupled with the low damping at altitude, it is not surprising, then, that the pilot was focused on trying to keep the wings level, which was occupying a good deal of his ability. It also would not be unusual for a pilot to be subconsciously pulling a bit with each lateral control input. Furthermore, the flight directors, which were biasing in and out of view, were commanding a pitch up as a consequence of the altimeters now showing that they were 400 feet low with the loss of pitot input. Exacerbating this, pilots today often see a lot of emphasis on staying on the flight director. Even assuming the indications are correct, attempting to stay right on the flight director bars at altitude becomes what the test community calls a “tight tracking task”. Tight tracking tasks are utilized in flight test to elicit PIO. Not ideal. The pilot pulled the controls back enough to increase the g-force momentarily. This led to an increase in angle of attack to the stall warning threshold. The stall warning responded with a momentary “Stall, Stall”, but discontinued before the “cricket” tone was generated. The monitoring pilot in the left seat asked “What was that?”, but beyond that, the Air France crew did not discuss this momentary indication. Did they just attribute it to turbulence? Based on the lack of any secondary indications, it is very possible that they assumed that the momentary warning was connected with the lack of airspeed indication. This is a training problem, as modern stall warning systems on transport aircraft utilize angle of attack. However, the aircraft continued to fly normally. Although not discussed by the crew or mentioned in the BEA report, flight tests reproducing AF 447 clearly showed buffet. It is hypothesized that the pilot perception of buffet may be strongly linked to fuselage flexibility, so the g-forces generated by the buffet might not represent what the pilots are actually experiencing. These might lead to a pilot mistaking buffet for turbulence during the initial stages. It is also possible that, while in the turbulence, the buffet is somewhat masked, or perhaps not as salient as the turbulence itself. As the buffet became severe it is possible that it seemed like some sort of unknown structural failure as discussed above. It would absolutely be outside of anything most pilots had experienced at that time. Many have wondered why the crew might have ignored the stall warning in the first place. It is likely that they viewed it as a false or spurious warning. Perhaps they just assumed it was another system failure associated with the loss of airspeed, as many pilots incorrectly believe that the stall warning might be impacted by loss of airspeed indications. Several crews reported that in previous probe icing events they had a single stall warning sound but ignored it as being “a blip” Regardless, this likely had an effect on the subsequent stall warnings, as research has shown that when a system warning is perceived to be false once (accurately or not), people will ignore subsequent warnings. As they continued to slow, the aircraft entered a stall again. Again, it appears that the warning was still not accompanied by salient secondary indications, or, at the very least, as described previously, not the secondary indications most pilots have been trained to expect. In any event, it is clear that warning was essentially ignored from that point onwards. No other discussion or mention of it occurred, even when it was repeatedly calling “Stall, Stall..cricket” The warning was just noise at that point. If there was buffet at this point it would be easily masked by the turbulence as they flew through the tops of thunderstorms. The aircraft would be experiencing a gentle pitch up due to aerodynamic factors discussed earlier, but the A330 FBW system would have just kept the pitch constant. Further, the system trimmed the stabilizer to the full up position. The stall warning continued for the next two and a half minutes. Clearly they would have heard it so why did they not react? Again, the most probable explanation is that they considered it a false warning. The aircraft AoA continued to increase, and that is when the shaking would have gotten to be serve. That coupled with the sound of the ice crystals may be why they expressed concern about overspeed. The airplane entered a “deep stall”. The airspeed become so low and angle of attack so high that the stall warning system stopped based on the assumption that the combination would be a false indication. At that point, a relatively dramatic nose down pitch would have been required to recover, and with full nose up trim, even full forward control stick would result in just a very slow pitch over. Transport aircraft rarely see nose-down pitches over a few degrees in normal operations, but after reaching this point, the aircraft would have required something in the neighborhood of 15 degrees nose down to start a serious recovery. Coupled with this, though, was that as the aircraft finally fully stalled it started to descend. Fast. The descent rate resulted in the measured g-force falling to around 0.6 g, vacillating between that and .75 g. Pushing forward on the controls under normal circumstances to get to 15 degrees nose down would be outside the experience of most pilots. How many pilots would still recognize the need when they were subject to g-forces where they felt they were already falling? Pilots are taught to “unload” to break the stall, but what if they are already “unloaded”? Under normal circumstances a stall at this altitude could require more than 5,000 feet to recover. In this case, would have taken much more. This means pushing forward to around zero-g for perhaps half a minute, at night, in a storm, when you’re not sure what is going on, while the aircraft is shaking like driving sideways across railroad tracks! From the time the airplane actually stalled to when it hit the water was just around 3 minutes. Not a lot of time to sort out what was happening. In addition to the confusion the crew was experiencing regarding what was happening, there was also a good amount of oscillation in roll. This is likely due to the aerodynamics of very high angles of attack, where the flow can have some very difficult to predict effects. The pilot flying had all he could do to try to keep the wings level. Sadly, allowing the aircraft to “roll off” might have pushed the aircraft out of the stall, but they did not know that. Again, if you do encounter buffet, one method that should work for about any airplane is to lower the nose and maintain a constant Mach number by reducing thrust. Whether you are in high or low speed buffet this will move you away from the buffet boundaries. In conclusion, it should be clear that the aspects surrounding high altitude stalls are complex. As outlined in previous articles, expectation bias and confirmation bias play their parts as well. In truth, there was really not a lot of time to sort it all out, and simulators are not able to replicate the situation adequately. It is hoped that this article will provide some insight and “food for thought” for pilots confronted with such a situation. For those interested in more on the topic, may I recommend my book written with Roger Rapoport, “Angle of Attack“. We explore this and many other aspects in much greater detail there. Load your CAD/structural design software on the cloud & access it via high performance virtual desktops with 24×7 support and remotely accessible from your favorite mobile device with CloudDesktopOnline. Visit www.Apps4Rent.com today to learn more about cloud products. 2 Responses to High Altitude Stalls – how well do you understand them?